8:00am BBT Good Morning Canada! Last night at 10:15pm we could see Neda, Kevin, Sindy, and Jackie on the landing couches talking about having a comedy show. Neda wants Kevin to roast people, meaning taking jabs at saying bad things about everyone in the house. Kevin does not want himself to be the only one doing it, he thinks that everyone should have a turn at roasting each other. After that discussion, the feeds went down and they have not been back up since. 3:12PM BBT Emily and Neda are outside at the hot tub. Emily says she and Kevin and Dillon were talking and said if one of them wins HoH next week they would put up Dre and Ika. They discuss how they think Dre and Gary's speeches were odd and that they don't understand Dre. Emily said she had a conversation with Dre and how she would handle autographs when they are outside the house. They change the subject to Jackie and how they both really like her. Now they are talking about the game and going over the stats a bit. Demetres comes out and joins them and they are chatting about a comp. Emily leaves Bruno and Neda alone. Neda says she was happy to clear things up with Emily this morning as it was awkward (something happened last night between the two). Dem says Emily is shady and Neda says she agrees 100%. They caught her listening outside the HoH door the other night. Neda tells Dem how Emily was saying she really likes Jackie and that she just agreed with her. Dem doesn't want Emily to know that Ika would be after Emily and Dillon. Neda says Emily knows the days really well. Neda tells Dem that Jackie has a cheat sheet calendar on a Crest White Strips box hidden in the bathroom and that she showed it to Neda and Bruno. He said that was dumb. She said penne noodles mean PoV, a Cheerio means HoH. She says they need to not just remember days, but events, and counting things. Sindy and Kevin know them really well. They are hoping the next week is not a double eviction. Jackie comes outside. They chat a bit then Neda and Dem go back inside the house leaving her out there alone. 3:35PM BBT Some of the HG are in the kitchen. Gary is playing pool with Karen. Gary says people have smoked 10 packs of his cigarettes and he is almost out while they've not been smoking their own. He is quite upset about this and says he is hiding the rest of them and is done giving them out. Karen says be careful not to piss the other HG off. He says he's already the target, he is not giving them anything else. They discuss how Dre is flip-flopping and why would Demetres keep Dre over him. Gary said he talked to Dem and he was not telling him who he is voting out. He said that is ridiculous. Karen asks why Dem would keep Dre over him? Gary says because Neda is threatening Dem. Gary says if he goes Karen is next. He says they will tell her it is because she was closely aligned with Gary, but it will really be because they just don't want her there. 3:44PM BBT Dillon and Ika are in the bathroom discussing who is talking bad about him. Ika says Emily and Bruno are 100% with Dillon. They both agree Bruno is a really good guy. They discuss how they used to both be angry people, but they have changed. He leaves the bathroom and Ika says to herself "I hope that worked". 3:47PM BBT Sindy, Neda, Bruno and Dem are on the couches upstairs chatting. 3:49PM BBT Gary and Karen are still playing pool. Gary says he feels like he can't trust Kevin at all. Karen says she has been telling him this already, but he said Ika confirmed it. He says feels stupid because Ika told him that Kevin is going to use his sexuality to get into people's heads and use them. He feels betrayed by this, but now he is seeing it from a different perspective so he could use it to his advantage. They both say Kevin is really bad at this game. Speak of the devil... Kevin comes out and sits on the couch to watch them play. Their conversation is now fully about stripes and solids while Kevin silently watches. 4:24PM BBT Demetres and Sindy are upstairs on the couches talking about competitions and speculating on what could come up for the next week. Jackie is in the bathroom doing laundry. William and Dre are having a discussion at the hot tub en français. 4:29PM BBT Ika and Demetres are now in the HoH room talking about if next week is a double eviction. He thinks that would be great if he got to be HoH again. Ika says you do not want to be winning all these things and becoming a target and he says he doesn't care, he is just having fun. They go over the discussion she had with Dillon in the bathroom earlier. Dem says Neda told him if she won HoH she would put up Jackie and Emily, but she might have been lying. Ika says Neda is a liar and that she will not try to win another HoH right now. Ika leaves for a minute and Sindy comes in. She and Dem are talking about who would write Sindy's letter if she won HoH. General chit-chat. 5:37PM BBT Ika and Dre are out by the pool. Dre is feeding Ika houseguest's names one at a time and Ika is brutally criticizing and dissing each one. She goes through Jackie, Emily, Neda and Sindy. 5:45PM BBT [Seems that Ika ripped up Jackie's study cheat sheet]. Jackie and Kevin are in the blue room going over the pieces of the ripped up parts, which are now in a box. They are going to recreate it. She is sure it was Ika, but then says "unless it was Neda". Kevin said he couldn't see Neda doing this. 5:50PM BBT Jackie goes into the pink/orange room and tells Emily about the study board she made and how it was ripped up. She says she thinks it was Ika and Dre. She had it hidden under her mattress. Emily asks to see it. She says that is just mean. 5:56PM BBT Emily and Kevin are in the blue room studying. Jackie goes down to the pantry to collect food to redo her study board. She is putting raisins and Cheerios in her pockets. 6:02PM BBT Ika and Dre are out by the pool. Dre says there is no way she wants to go out before Jackie. 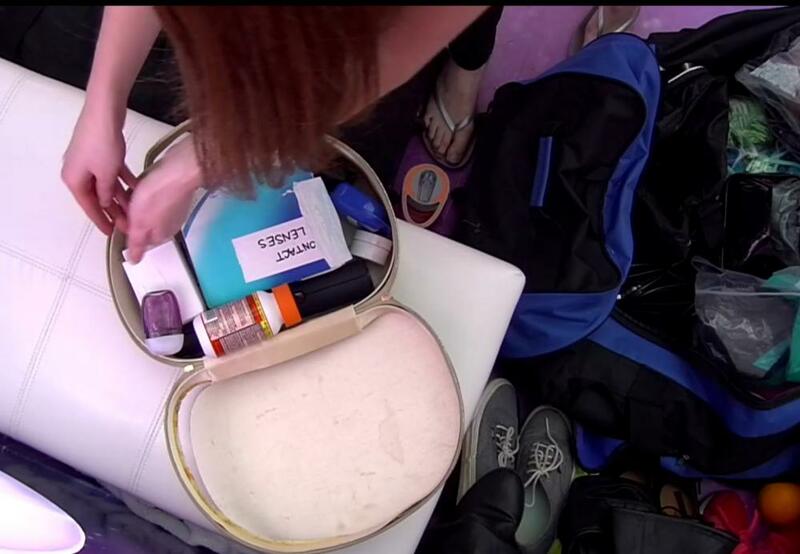 Jackie sneaks the box to the pink/orange room and puts the food in it, then hides the box in her duffle bag and leaves the room. 6:11PM BBT Gary and Will are left alone in the blue room discussing how Kevin is 'using his sexuality' with them. Gary correctly guesses that Kevin is telling Canada he's just using it to get further in the game. Gary says he thinks it actually helps himself and Will. 6:16PM BBT Ika is doing makeup in the bathroom and Kevin joins her. They say if Jackie wins she will probably put up Ika and Demetres or Ika and Dre. Neda comes in. Emily says for a moment she thought it could be Neda, because in Neda's season, when someone who was on slop that she did not want to win veto, she threw out all the condiments to make it even harder for them. She is still sure it was Ika. Jackie is wondering what she did to be treated like this. Emily says it is petty. She says she is on the fence with Sindy. They do not talk game very much. Jackie says she has talked to Sindy about Ika and asks why she has to be so mean. 6:25PM BBT Dre is in the kitchen talking to Sindy and Ika. Dre is talking badly about Jackie. 6:30PM BBT Emily asks Jackie: Do you think Sindy and Ika are working together? Jackie says maybe the 3 of them: Neda, Sindy and Ika. Emily says Ika walks around like she feels so safe. Emily says if one of them wins HoH they should put up Dre and Ika beside each other. 6:33PM BBT Sindy and Ika are in the pantry. Sindy says that Dre told her before that it was Jackie's idea to go after Kevin and Bruno, but put it on Cass. 6:34PM BBT Emily is telling Jackie that Gary was telling her he has never been after Emily or Dillon and that his game is that he never lies. William comes out and their game talk stops. Dre, Sindy and Ika are in the kitchen again talking about Jackie. 6:40PM BBT Ika walking around upstairs looking for her boots. She mutters to herself "I hate every last one of these b**ches in this house... it's not healthy to feel this much hatred." She goes and gets Gary and they go outside to the hot tub area. Ika says her heart is filled with hatred and she needs to get it out. She says she can't contain it. Dre joins. Ika says Emily was especially annoying her this morning. Dre and Gary tell Ika to use the words "strongly dislike". She wants to keep using the word hate and says she feels it in her stomach. She goes on about this for several minutes ranting and yelling and repeating herself. Gary and Dre are laughing at her and he is trying to give her tips on how to handle the situation. She continues to rant. She says Jackie and Emily are the most fake in the house. She says Neda is fake. Gary says he wants to see if Neda & Emily get back together. Ika says they are already. He says wow, after they talked crap about each other all day. Ika says she does not go out of her way to talk to Neda and Emily about game, but they keep coming to her. 6:54PM BBT Kevin comes out to the hot tub area and Ika leaves. Kevin calls himself Gary's temporary Big Brother husband and says he is falling in love. Gary laughs at him. They go to get ready to work out. Sindy is talking to Dillon about sports in the kitchen. 6:58PM BBT Ika and Gary are now in the blue room. Ika is fired up. Gary says "Can you try to control it a bit, please?" She agrees. 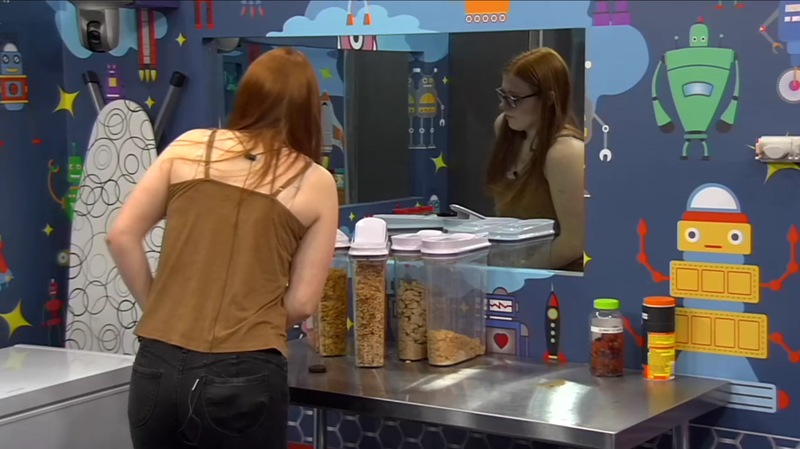 Ika is now wondering if something is going on because she points out that Demetres has been gone for a long time, in the Diary Room. Gary says he and Dem had a great conversation. Ika says Dem said to her "Gary had some great points", but they didn't have a chance to talk. She said she will be able to talk to him at night. They are saying Sindy keeps inserting herself into their conversations so they don't get a chance. 7:02PM BBT Bruno and Kevin are at the hot tub discussing what might come up in the game. Bruno says he sees Ika and Dem wanting Dre and William there so they (Dre/William) will go after Bruno and Kevin. They say Dillon and Emily are crucial to their game. They would like Dillon and Emily to win this HoH and consider even throwing it to them. Bruno says Dem & Ika are tighter than anything and that Dem is in love. Kevin is hoping it's a 9 person jury because Neda will lose her immunity. They are with her 100%, but it wouldn't hurt for her to go. Bruno says that is why it is better for Gary to stay for their game, but they can't start pushing for Gary to stay as it would look to weird. They would want Gary to go after Neda. They agree they are with each other 100%, would never vote against each other, would use the veto on each other. They say they feel this way about Sindy too. 7:07PM BBT Gary says he is letting Kevin think he is playing him. Ika says she really wants Gary to stay in the game. 7:11PM BBT Gary says he is trying to plant a seed with Will that he can trust him. He says Kevin does not talk game to Will. Karen comes into the room and Ika starts talking about her hate again. 7:13PM BBT Sindy is in the pantry with Bruno talking to him about Jackie. Jackie is telling people that she and Dre are good, but that Jackie wants Dre out because she wants to be with William. Sindy says Jackie is acting like she thinks she is a puppeteer. 7:24PM BBT Ika asks Gary if he wants her to go talk to Demetres. He says no, just give him some space. Ika says the fact that Demetres has not told her what he is doing looks bad [for Gary]. Ika says whenever Dem has won HoH Neda has pulled him aside. Karen asks why Neda would be so against keeping Dre over Gary. Gary says he wants Neda's head and she knows that. Ika says the only 2 people that she has her backs should know it. [She says this to Gary in front of Karen. Karen would have to know Dem is 1 of those 2 and Gary would be the other]. Ika leaves the room then remembers she hates everyone in the house so she comes back into the room. Karen says Kevin and Jackie are her targets. Ika says if Jackie wins HoH she would put Karen and herself on the block. They tell Jackie stories. 7:32PM BBT Bruno and Demetres are in the hot tub also dissing Jackie. Demetres is paranoid someone is listening in because he sees the camera zoom in towards the door. He gets out of the hot tub to check, but does not see anyone. Bruno wonders if Jackie's seen her ripped up study sheet. Dem figures she has as she was acting pretty emotional. He says if you are going to have something like that, be secretive about it, do not tell anyone. They talk about how dumb it is that she told people. They are discussing Ika ripping up the sheet. Demetres says he has been trying to keep Ika calm and that she was likely bored today and needed something like that to do. They figure she has been getting a lot of TV time. They say they are glad they are 'in' with Ika as they would not want to be on the receiving end of that. They agree that you are good with Ika... until you are not. 7:39PM BBT Emily, Dillon and Jackie are sitting on the outside couches talking about playing with cups/cup games/comps. 11:00PM BBT Kevin and Gary are laying out by the pool. Gary says he knows Kevin is with the other side of the house. Gary says he knows energy, he can tell what is going on, and he wants Kevin to know that he knows. He can tell Kevin is BS'ing him. Gary says he could screw up Kevin's game, but he is there for him. He says Kevin needs to let Dem know that Gary should stay and take back what he said to him about keeping Dre and that Gary should go because he is a strong player. Gary says he is not working against him, he is with him. He says he Kevin needs to tell Dem he will work with (for) Dem and will target whoever is after him. Gary says he is more with Kevin than Bruno is. Gary asks Kevin why he doubted him and why he planted seeds to get him out of the house when he did nothing but prove to Kevin that he had his back. Kevin pleads ignorance. He says he is not sure what Gary is talking about and Gary offers to give him details like what Kevin said and when. He says he is aware where everyone is in the house at all times and he knows what is going on. Kevin continues to play dumb and this makes Gary mad.